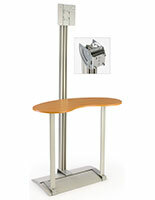 The Monitor Stand that Features a Kidney Bean Shaped Shelf is Perfect for Temporary Trade Show Exhibits! Ready to Ship Monitor Stands For Sale Online! Floor stand positions a TV at an ideal height for comfortable viewing. Fits 60" monitors, weighing up to 80 lbs. Stand features a curved countertop to encourage visitors to interact with a presentation. VESA compatibility corresponds with most televisions (except those with a width of 200mm). No tools needed to set up. 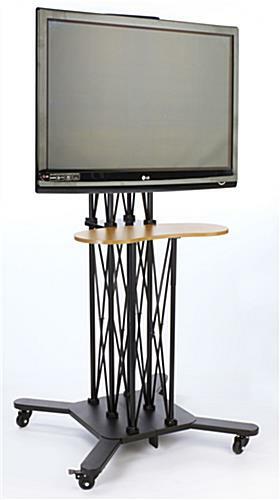 This TV floor stand works well as a temporary fixture, such as during a trade show event or at a convention. The freestanding mount is designed to hold a 60" flat panel LCD television, such as those from NEC®, Sony® and Vizio®, that weighs less than 80 pounds. 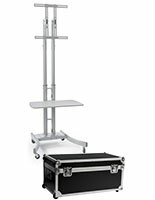 This black TV floor stand, also known as a portable monitor display, is equipped with a VESA-compatible bracket to fit standard-sized screens. 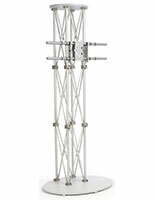 Please note that due to its truss-like structure, the fixture will not accommodate 200mm wide VESA measurements. 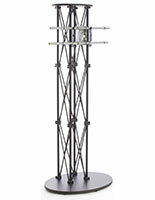 This TV floor stand with wheels can easily be relocated throughout a room or building. 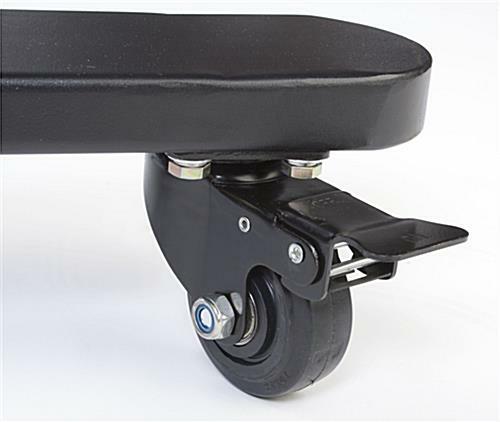 Once in place, simply lock the casters to increase the fixture's overall stability. This TV floor stand that holds a flat screen plasma television is also provided with an MDF shelf. This 31-1/8" wide counter is ideally meant for showcasing a selection of product samples or literature. The shelf may also be used to create a more interactive presentation or workstation, placing a computer or a laptop at a more easily accessible location for customers to utilize. 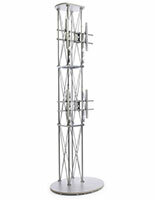 The plasma TV floor stand that measures 74" tall is shipped unassembled to save on costs. 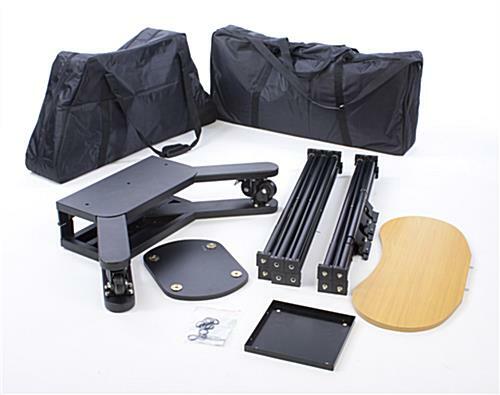 Setup is simple and takes only minutes to complete. 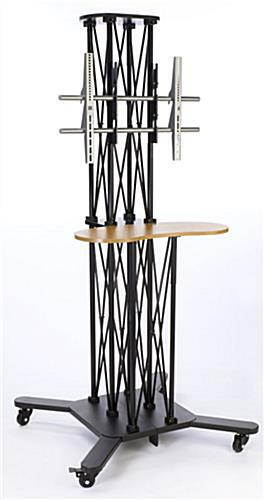 The TV floor stand that has a truss-like display easily screws together without the need for tools. In-between events, the freestanding fixture knocks down into a few separate pieces, all of which store within the two provided bags. 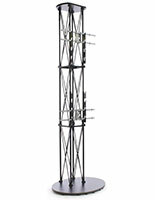 This TV floor stand is capable of displaying a flat screen LCD monitor either vertically or horizontally. The portable television mount is perfect for employment during a trade show or within busy retail stores, bank lobbies and hotel foyers. 38.3" x 9.0" x 38.0"
41.0" x 18.0" x 6.5"
41.0" x 20.5" x 10.0"